The scene shows a statue of Pallas Athene, goddess of wisdom, on an altar. A group of putti are garlanding the statue, while their companions pour incense into an offering vessel. The drawing was inspired by Paul Troger's time in Italy, a period of several years. Together with Martin van Meytens among others, he “studied ancient monuments in the vicinity of Rome with such unceasing diligence that very often we only made do, for days, with bread and water in order to continue with our study without disturbance”. The artist modelled the central motif on a statue of Pallas Athene from the famous collection of ancient art assembled by Marquis Vincenzo Giustiniani (now in the Vatican Museum, Rome). The statue was also known from a print of 1631 and from pictorial publications on ancient sculpture. Paul Troger employed a subject similar to the Brno drawing in an etching from 1724, the origin of which is provably associated with the artist's stay in Rome. Troger's etching and the Brno drawing resemble the engraving technique of Venetian peintre-graveur, using a fine grid for the modelling and to capture transitions in light. Typical examples may be found in the work of Giovanni Battista Tiepolo (1696–1770), a major exponent of Italian Settecento painting. The subject of adoration of the goddess of wisdom reflects the growing emphasis placed on education at the time. 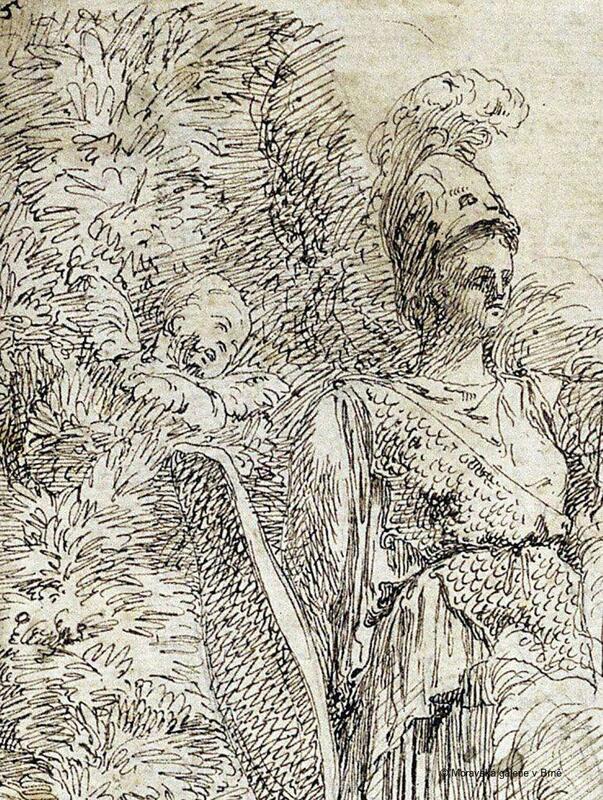 Troger's unfinished drawing probably served as a template for a print celebrating Wisdom. 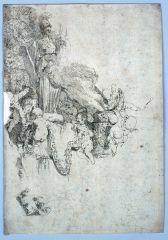 The principal motif is worked up in detail, while the accompanying figures of putti and the landscape in the background are sketched in pencil. Continuous wavy lines give evidence of a swift and expressive drawing manner. The artist was an influential professor of the Vienna Academy and was a leading Central European painter of the 18th century. 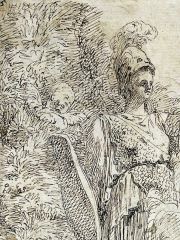 The drawing of a statue of Pallas Athene was inspired by Paul Troger's long stay in Italy. Its execution resembles Venetian peintre-graveur. The unfinished drawing was probably to serve as a template for a print celebrating Wisdom. The determination of the artist is based on a confirmed provenance. 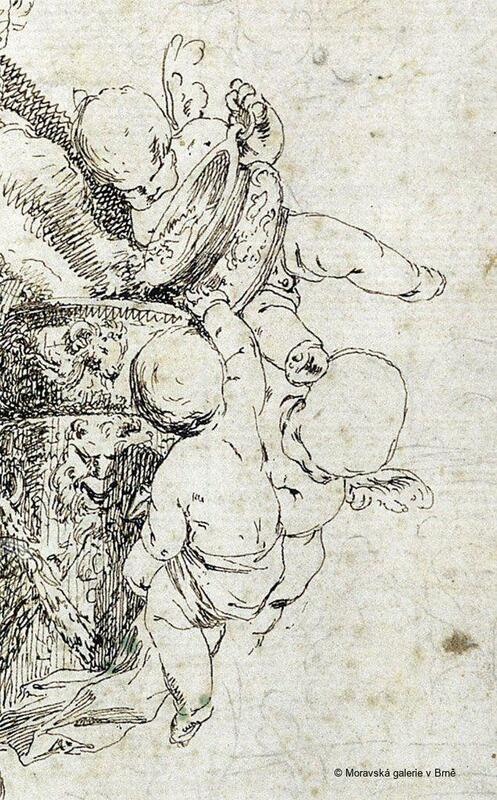 Troger's authorship is proven, in particular, by the distinctive faces of the putti and the brisk drawing manner. The drawing probably comes from the estate of the sculptor Josef Winterhalder Sr., a friend of Troger. It was donated to the gallery by Mrs Trapp before 1963, and was previously found in the collections of the archivist and historian Jan Petr Cerroni and Mořic Wilhelm Trapp, a curator of the Francis Museum in Brno. Wanda Aschenbrenner – Gregor Schweighofer, Paul Troger, Leben und Werk, Salzburg, 1965, p. 130, cat. 14, p. 154. Lubomír Slavíček, in Jiří Kroupa (ed), Dans le miroir des ombres. La Moravie a la age baroque 1760–1790, Brno–Paris–Rennes, 2002, p. 249, cat. 93. Jiří Kroupa, in Eduard Hindelang – Lubomír Slavíček, Franz Anton Maulbertsch und Mitteleuropa, Festschrift zum 30jährigen Bestehen des Museums Langenargen, Langenargen–Brno, 2007, pp. 27–28.